Turmeric has been used for century upon century as a very beneficial health care supplement. Traditionally used in Indian medicine and various other ancient practices, the plant can heal a range of conditions including; high cholesterol, inflammation, gastrointestinal problems, stomach ulcers, cancer cells, Alzheimer’s disease, skin irritations, intestinal worms, menstrual cramps, bruising, liver problems, stomach ulcers, eliminating toxins in blood, treating colitis and pancreas disease. It can be used in cooking or consumed in liquids, but these days it is sold as one of the best natural supplements. 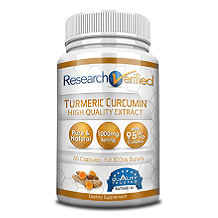 Too Healthcare Turmeric is one company that boasts their product to contain 95% curcumin (approximately 475mgs), which is the essential active ingredient in turmeric. The manufacturers also state that the product is very quick to absorb and therefore fast acting, due to its capsule coating. They further boast that users of their product will have increased; immune system function, liver and gallbladder function, cholesterol balance and better digestion. So what is in this product that makes it better than the rest? Well there is a significant amount of the active ingredient (curcumin) and the coating of the capsule may contain piperine, which is a powerful absorption aid, but it does not readily state what causes it to be so fast acting. Continue to the below information regarding the price, product guarantee and ingredients found in Troo Healthcare Turmeric. The manufacturer recommends that 1-3 capsules be taken daily for maximum benefits. Consumers should always consult with a health care practitioner to ensure the right dosage is prescribed for the correct supplement. The price of Troo Healthcare Turmeric is £11.98 for one bottle. However, if purchased from the manufacturer, the price is discounted to £9.97. If shipped within the UK, shipping is included in the purchase price. Troo Healthcare offer an unconditional refund within 45 days of purchase, which is a reasonable product satisfaction guarantee. This provides peace of mind for customers to try out the product, but it is not an extensive timeframe to see necessarily see results. 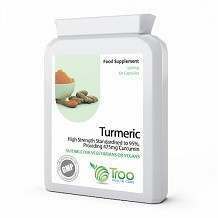 Overall, Troo Healthcare Turmeric is a reasonable choice in the turmeric supplement industry. The manufacturers product guarantee, the quality ingredients and the decent price, make it an appealing product. However, there are products that are more attractive.